From Wikipedia: ALTA and the American Congress on Surveying and Mapping (ACSM) have jointly developed a set of land surveying standards, with the goal of promoting uniformity in survey information. An ALTA survey is a boundary survey prepared to a set of minimum standards that have been jointly prepared and adopted by the ALTA/ACSM. Additionally, an ALTA survey shows improvements, easements, rights-of-way, and other elements impacting the ownership of land. 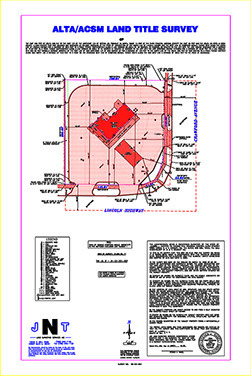 An ALTA Survey is often prepared for commercial properties, as it will provide the title company with the information required to insure the title to the land and improvements to the high degree that a commercial development may require. In addition to the minimum standards set forth, a table of optional elements is included in the ALTA/ACSM standards. A careful review of the elements from the optional "Table A" is helpful in delineating a clear scope of the land surveyor's services. A current title commitment is required before an ALTA Survey can be completed. The surveyor will refer to the title commitment for the legal description of the property and for the legal description of any encumbrances (exceptions). Areas of ownership, improvements and encumbrances will be shown graphically. If the survey discovers any encroachments, they should be shown graphically, and a note indicating the nature of the encroachment may also be added. The certification language of the ALTA Survey should include the names of the affected parties, including as appropriate the buyer, seller, title company, and lender. The surveyor must work in close association with the title insurance company, as the surveyor and the title company are relying on each others work to show the matters affecting the ownership of the land and improvements in a comprehensive manner. An ALTA land survey has especially stringent requirements as developed by a joint effort of the American Land Title Association and the American Congress on Surveying and Mapping. The ALTA standards are a nationwide uniform set of standards. Sometimes referred to as "the Cadillac of surveys." The survey is specifically designed to satisfy the needs of lenders, corporations and title companies when dealing with valuable commercial properties. ©2016 JNT Land Survey Services, INC.